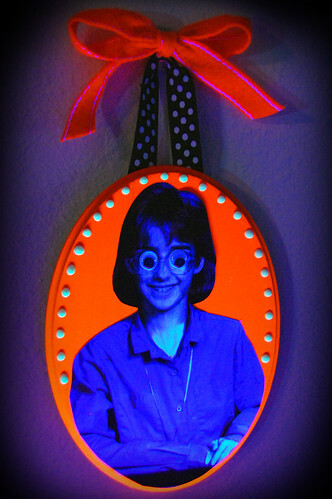 Make a silly wall hanging from an old school photo! This is more for those people who like more fun and less scary Halloween decorations…very goofy and full of whimsy! I used a photo of myself from 4th grade. Geez, oh pete, cute hairstyle, huh? I think I am stylin’ in my shirt and zipper necklace. Ha, I kinda wish I still had that necklace, but at least I still have the pic. Anyway, here’s how you make this project! 1. Spray paint plaque with neon spray paint. Let dry. 2. Print out black and white photo to scale of plaque. Cut to fit plaque and glue down using foam brush and Tacky Glue. 3. Cover any white areas of photo with Glo in the dark paint using small brush. Word to the wise…I used an inkjet printout and it the ink smeared slightly, so this is why I think it would be better to use an inkjet print. 4. Dot around entire plaque with dimensional paint. Let dry. 5. Cut ribbon to fit on back for hanger and glue in place with glue gun. I actually used two ribbons in black/white polka dot and orange. I think this would be funny if you made several of these with different kids or different family members. Nostalgic photos would be great for this too! I can just picture some funny hairstyles and classic “senior portrait” poses. I actually lit this up with my blacklight! I love, love the look of neon colors under a black light (I practically foamed at the mouth when I saw the blacklight section in Martha’s Halloween mag last year). I totally want to have a party that is all blacklight one of these years! I love it. Oh, and on a random note, tie dye looks sooooo good under black light too. Looks very creepy and spider webbish. Hope you have a great Tuesday! Until next time Swellions! Okay this is just too fun! Another fab idea from the Queen of Halloween! You’re so funny! I love this! I’m all about the whimsical, that must be why I love your work! This one made me giggle! I think we all may have one of those old school photos we could make over into a halloween picture lol! Thanks for sharing this fun project! I love how you have used your own image to create this and have some light hearted fun! Very inspired!!! I have a boatload of old pics that would work for this one (sigh)! Actually, I think it would be a fun project for a child, too – I’m sure my son would get a kick out of turning one of his photos goofy like this.